Dreamy beach getaways on an island with your significant other where each hour of the day is a different hue of Instagram worthy beaches! What could get better? Think luxury villas with discreet service, spa resorts and some of the best beach hotels in Sri Lanka where you awake to sweeping views of a turquoise, warm Indian Ocean. Sri Lanka certainly hits the sweet spot. Where in the world is Sri Lanka? Well, this speck of an Island where you are spoilt for choice between doing nothing by the beach and packing everything in from wildlife to 2500 year old culture to adventure and tea experiences, is just a 4 to 4 ½ hr flight from Dubai and Singapore. Check out flight deals to Sri Lanka on Sri Lankan Airlines, Emirates, Singapore Airlines and Qatar. Here’s an island which Emirates Woman picked as one of five romantic island getaways from Dubai! Ayu in the Wild staff picked out their guide to 8 of the most romantic beaches in Sri Lanka. Travel time – 20-minute drive from the airport, 45 min. drive from Colombo city. Oh those sail boats on this Instagram perfect beach along the west will take your breath away. This beach remains fabulous most of the year. Quintessentially, a fishing town, Negombo is worth a night or at most two and is so, so close to the Airport. Take a boat ride on the lagoon, walk through local markets, observe the traditional fisherman at work or take a peak into locals making toddy. That’s only if just lounging on the beach is not your thing. Travel time – 3 hr drive from Anuradhapura, 3 hr train ride from Anuradhapura and a 2-hr flight from the BIA International Airport Charter Flight from Cinnamon Air where an Ayu in the Wild Chauffeur will pick you on arrival. Tours to the unexplored North of Sri Lanka beckons travelers to Jaffna after many decades. The choice of accommodation is just right for this uncrowded region; a few hotels and some private villas tastefully furnished. Casuarina beach about 40 minutes away from the railway station leads to calm shallow water which you can wade in for miles as it’s protected by a reef. This beach is so untouched you can see the surprise in the locals eyes! Wondering about other things do in Jaffna? We love Jaffna food! Try curries to the freshest sea food and a myriad variety of Mangoes. 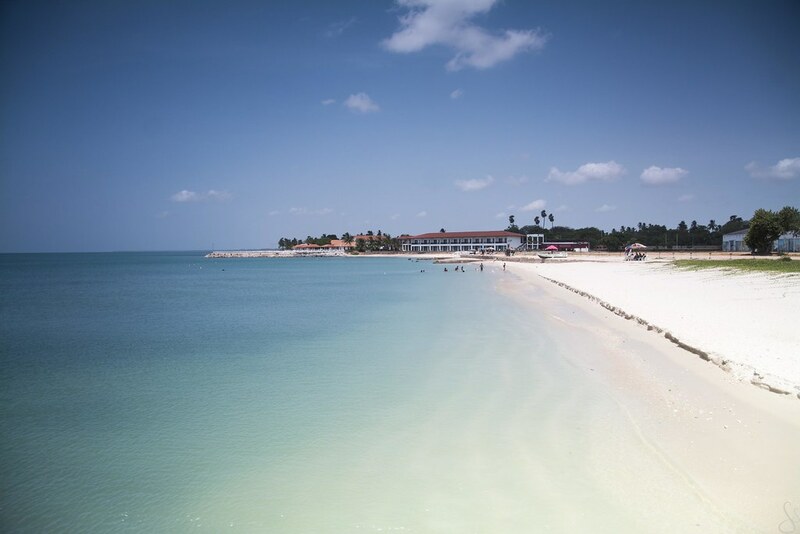 November to March in Jaffna is great for bird-watching or explore the beautiful Delft Island with remains of a Portuguese fort and wild ponies on the loose. Walk through local markets or absorb the rhythms, fervor and faith inside Nallur Kovil and finally climb up the Jaffna fort walls and capture that Instagram worthy sun set. Just perfect for 2 to 3 days! Travel time – 2 hr drive from Anuradhapura and Sigiriya and 45 min flight from the BIA International airport. The turquoise east coast calm waters and white sandy beaches best visited from April to September makes Nilaveli perfect for a romantic holiday by the beach. (Hint: Best Instagram worthy picture is when the sun is out and the Dolphins and Whales make an appearance)! Highlights of Trincomalee are the old Fort Fredrick, the Koneshwaran Kovil and snorkelling at Pigeon Island. Don’t forget those spur of the moment visits to see fishermen pulling their nets in at small coves of beaches and visits to the tiny local markets that Ayu in the Wild always throws into each tour! Travel time – 6 hr drive from the airport, 2 hr drive from Trincomalee beach, 3 ½ hr drive from Jaffna and a 50-min flight from the BIA airport. Secluded, off beat and almost off the map. Certainly not your usual pick of the best beaches in Sri Lanka as there is no accommodation nearby. Yet, this tucked away beach in the deep north-east coast off Trincomalee is one of those random picks where you can take a couple of beach chairs or a mat, pack in some snacks, lunch and sunscreen and spend a quiet few hours on a calm beautiful beach. The Thiriyaya Vatadage though in ruins still remains one of those unique places to visit in and around Trincomalee and can be coupled with a visit to Arisimalai. Travel time – 4 hr drive from the airport, 1 ½ hr drive from Galle and a 1 hr drive from Udawalawe. Private beaches! Need we say more? Tucked in far away from crowds, those quiet, quiet sandy strips bordering the deep waters of the southern beaches in Tangalle spells the ideal atmosphere for intimacy. Best visited between December and April. Tangalle has yet to hit the Instagram worthy list of beaches (and we hope it stays that way to keep crowds at bay)! Book the holiday specials with Ayu in the Wild at the super, super luxury Anantara and Aman Resorts or unique stays at Eco Lodges and explore the beauty of a temple upon a 200-meter-high rock, meet the rural people of the South for authentic local experiences and take guided safaris to Udawalawe and Yala National Parks, bird watching safaris in Bundala National Park and Kalametiya bird sanctuary. Travel time – 1 hr drive from Polonnaruwa, 2 hr drive from Sigiriya and a 30-min. Daily flight from the BIA International airport. An Ayu in the Wild Chauffeur will pick you on arrival and whisk you off to your luxury beach resort. Iconic, luxury, high- end accommodation in Sri Lanka dots this east coast beach, and miles and miles of crystal blue waters will lure you to….just do nothing. A perfect foil to the excitement of our guided tours in Sri Lanka’s incredible World Heritage Sites of the Cultural Triangle, a short hour or two away. If you must take a break from the lazy days of summer sun, here’s our top pick of Instagram pictures worth taking in Pasikuda Sri Lanka;- ride jet skis, take in a morning of water sport, a spa treatment in the luxury resorts or spend a fun morning out on a Yacht. Travel time – 3 hr drive from the airport. 1 hour 30 minutes to Wilpattu National Park and 2 hours to the World Heritage Site of Anuradhapura. A scenic drive along the west coast with the inviting waters of the Indian ocean on one side and farmlands and salterns on the other gets you to Kalpitiya. Best visited from November to April. Luxury accommodation in Kalpitiya adds to the aura of this romantic hideaway in Sri Lanka. Travel time – 1 hr drive from Galle, 3 hr drive from the airport and a 2-hr train ride from Colombo. Yes, Mirissa made it to Sri Lanka’s Most Instagrammed Places! And with reason. Intimate boutique villas that redefines luxury. Private luxury villas where the worlds rich and famous holiday, discreetly. Sun dappled and moonlit beaches makes Mirissa definitely a romantic beach escape with so much to do, if you can bear to be away from a stroll along the beach under the purplish hued orange skies. Visit the eclectic Galle Dutch Fort with its cobblestoned alleyways, take a Cinnamon walk with a traditional Sri Lankan lunch for two and that unique experience launched by Ayu in the Wild a private safari on your own luxury Yacht to photograph Blue Whales, guided by a marine mammal specialist between November to April. Contact us at Ayu in the Wild, holidays for tailor-made itineraries to make your beach stay extra special.